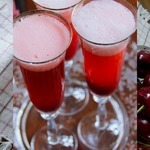 This is a print preview of "Cherry Amaretto Clafoutis syrup cocktail" recipe. or return back to Cherry Amaretto Clafoutis syrup cocktail. Cherry chocolate Amaretto Clafoutis inspire a cherry Amaretto syrup cocktail. How happy accidents take place when least expected.
. Pour ALL the liquids in a large pitcher. Stir.
. Distribute the ice-cubes in each glass.
. Pour the prepared cocktail evenly throughout each chosen style glass.